Alcorn McBride’s suite of audio products offer a comprehensive set of solutions ideal for theme parks, museums, and other themed attractions. 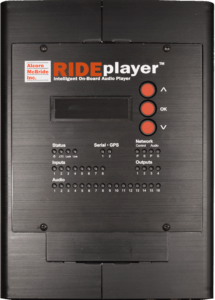 This includes compact and rugged audio devices designed specifically for ride vehicle environments as well as rack-mount devices for applications that require multi-channel synchronous playback or point-source audio playback. 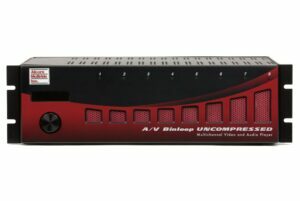 These devices offer professional features like polyphonic playback, Network audio output (Dante, AES67, or Cobranet), integrated DSP, and amplification. Whether you need a small player for a stand-alone HD display or crisp 4K120 uncompressed projection, there’s a video player in our line that’s perfect for your application. These purpose-built devices use the latest in solid-state technologies to ensure smooth reliable playback with performance and reliability that PC-based servers simply can’t touch. Alcorn McBride offers you two completely different approaches to DMX lighting control, depending upon your requirements. Both choices may be used with a show controller or as stand-alone lighting controllers. Our LightCue line is the preferred playback solution for Lighting Designers, while the DMX Machine is robust enough to perform as a complete show controller. Our show controllers are built for show control. Our line of show controllers are not PC’s, meaning they are not susceptible to crashes, viruses, or spyware. Alcorn McBride show controllers are built to run your show, period. The world’s largest Theme Parks, Museums, and top Design Consultants rely on it and would never even consider letting a PC run their show. Please browse the line to learn more.